I forgot to post these. This year the Autobots from the loose Transformers reviews plus the Mini-Con Assault Team helped decorate. I just need to figure out what I’m doing with this area after Christmas. Do I put that comic stack back there until I can get the next phase of the comic organizing project done or put something else there and leave the comics where they are until said phase occurs. I didn’t have room to add the Decepticons reviewed. Happy New Year, everybody! Let’s hope this year is better than the last one. In other words, no more surgeries and long hospital stays for myself and members of my family. Between my problems, my cousin damaging his skull (praise God he’s healed), and my Dad having work on his hand (plus an old co-worker who had a motorcycle accident and needed leg surgery and my neighbor who lost a foot), one of my best friends losing his mom to the same cancer that killed his dad years earlier, and one of my reviewer colleagues whose stepfather died in a car accident, this has been a horrible year even if you don’t follow politics and celebrities. I’m praying for a better 2017. I’m also hoping to get back to my clutter-clearing in force and working on other projects that I hope will lead to bettering my future. I know I usually do this on Christmas, but I didn’t get THIS year’s Christmas video review done for my other site (and it’s still not done) as I was rushing to get a comic done for Christmas day (which was a day late). I’m rather annoyed by that, but it’s been that kind of year, folks. Still, today’s review from last year’s Christmas is something I actually own, and so it works for this site, while last year’s review was done of something I found online (and came from two years ago). Rankin/Bass’s The Little Drummer Boy comes from a collection of videos released by Sony Wonder as part of their “Original Television Christmas Classics” box set, seen above on the left. My version looks like a little book, but more recent releases just uses the typical set containers. They’re all Rankin/Bass productions, and my version was packaged with a separate video containing the subject of my first BW Christmas Video Review, A Cricket On The Hearth. So let’s see how this movie holds up. 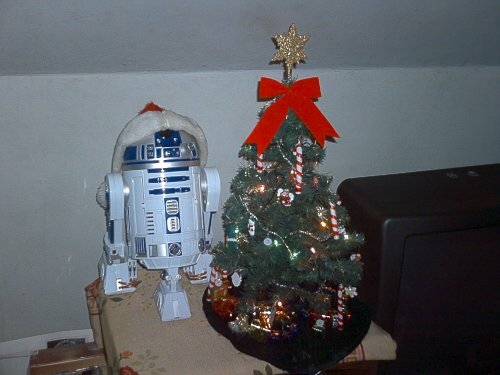 Even our little R2 unit is ready for the holidays. Long time readers may recall my usual Christmas tree. I got it from a customer at the store I worked at and it’s been good to me. This year as my dad was going through my late grandparents Christmas stuff he found another tree that he talked me into because the lights were already on it. As you all know I’ve had a hard year and while I still wanted to decorate I just wanted to relax this year and putting lights on even a small tree like this can be frustrating. So I agreed to try this tree out. Unfortunately I had a bad day yesterday starting with my cereal getting soggy while trying to find something to watch during breakfast. While did it didn’t go downhill from there (I’ve been at the bottom of the hill enough this year) it did set the tone for the day outside of a friend visiting. It kind of continued to the tree. Not that it’s a bad tree though. The full title of this movie is The First Christmas: The Story Of The First Christmas Snow, but I usually just call it The First Christmas Snow. I’m not going to say it’s a hugely important movie but it’s one I’ve been looking for for a while. Last year it finally came out on DVD and I decided to do a Video Review of it for my other site. As I work on this year’s video you can check out last year’s. A Merry Christmas to you. I didn’t get to finish the computer supply drawer this week because I had Christmas decorating to do. 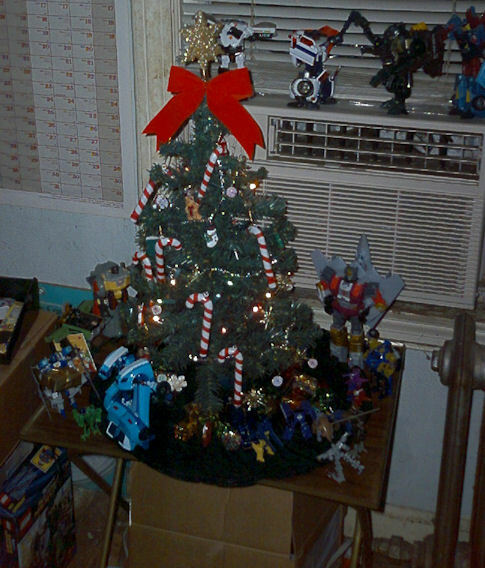 As last year, the Autobots are celebrating Christmas around the tree because I needed somewhere to put them. So let’s see what the heroes of Cybertron are up to this year. Nothing says Christmas like an Astromech droid. The continued work on the media supply drawer (I think that name fits more than just computer supplies) took a backseat. I had to organize a bunch of papers so I could clean off the table I set my Christmas tree on. And during the next week I’ll be putting up Christmas decorations. I think I’m all out of Christmas things to review except for my videos and maybe I’ll try my hand at music with the few music CD and cassettes I own. (Yes, I still own cassettes. And records.) And I still want to finish the media supply drawer if I can. However, the main focus will be getting this year’s Christmas Special Review done for the other site and maybe dust up here. But I will try to have something up here at The Clutter Reports. With Christmas comes Christmas projects. 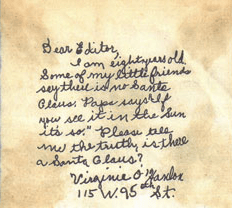 Namely, the Video Review special and the Christmas mini-comic I want to do every year. So this is the last post until Christmas is over. So I thought I’d make it a good one. For one thing, there’s the Christmas tree picture I promised last week. This year the tree is surrounded by Bumblebees. Obviously this means the Bumblebee shelf is kind of empty but it’s only for a few weeks. The other thing I’m leaving you with is LAST year’s Video Review. A few years ago I picked this up. On the left is “The Original Television Christmas Classics” featuring a number of classic Rankin/Bass Christmas specials. The new version has a few different specials than my collection but doesn’t have a box that resembles a storybook. That’s kind of a shame. 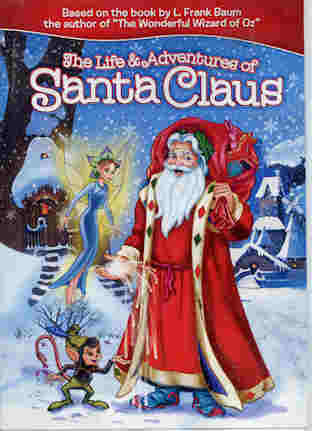 This box has Rudolph the Red-Nosed Reindeer, Frosty The Snowman and Frosty Returns (no, that’s not the one that introduces Frosty’s wife), Santa Claus Is Coming To Town, and The Little Drummer Boy (sadly “Book 2”, the sequel, is not included), plus a CD of Christmas songs from the specials. Where I picked this up was included a separately contained DVD, the one on the right. A Cricket On The Hearth was one I never heard of prior to picking up this set. Time got in the way of seeing it until last year, when I decided to finally watch the video as a potential review for my other site. What resulted was a “BW Video Review” of the special, featuring Danny Thomas, his daughter, Marlo Thomas, and Roddy McDowall as the title character. As my last Clutter Report until after Santa has completed his route, here is that review, done for BW Media Spotlight and my other home, Reviewers Unknown.com. Next weekend I’m breaking out the decorations for Christmas again. So this weekend I need to clean some space to set up my tree, manger, and sleigh. So pardon my lack of posting. Christmas is rather busy for me, thanks to work, shopping, and getting a special Video Review and mini-comic for Christmas Eve and Day respectively. I’ll do what I can, though.